I continue to piece together the sketchy lives of my ancestors and to get a greater vision of who my family was. Even if I can explore our most recent generations, I will leave to my children, a sense of the strength and fortitude of our family. As the oldest girl, I think that Marion Ada likely came to Canada early on, with John, although I haven’t had much luck in substantiating that. She is late to get married, at the age of thirty, but I am very happy that this English lady found her Irish man and headed north to Muskoka. Anyway, I will begin the construction of ‘what I know’ here. John and Grace are living at 29 Hatfield Street when Marion Ada is born and baptized on January 21, 1872 at Christ Church in Southwark, Surrey. John, at this time, is listed as a sawyer. 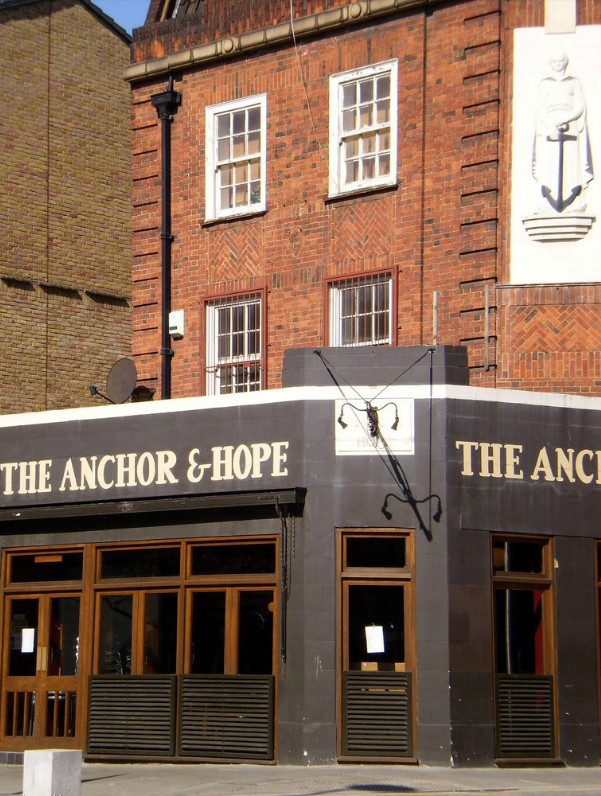 Present day Google Maps takes me to this pub at that particular location, so I imagine that an upstairs room of this building may have been the wee family’s abode. I’m supposing this, but have no fact. I find her living with the family at 42 Princes Street, now Coin Street on the 1881 census. Now, John is a grocer and owns a little shop. Here lies the mystery…what year did Marion Ada first travel to Canada? 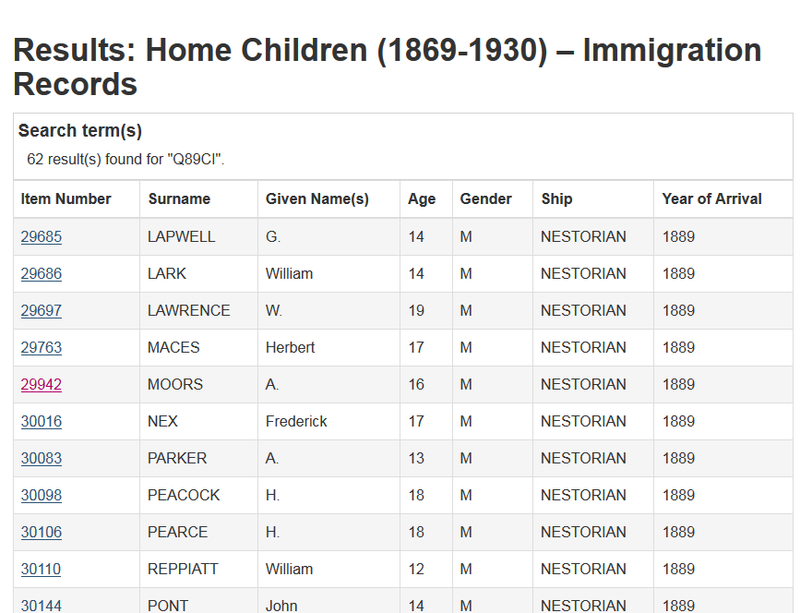 I find an A. Moors listed as a male, traveling on the Nestorian with other child ‘labourers’ who all appear to be male. Is it possible that she ‘passed’ as male to get passage? She is on no other immigration documents that I can find. She is sixteen years of age, three years older than John who arrived at the age of 13. If anyone has any wisdom about this, I’d appreciate the insight. 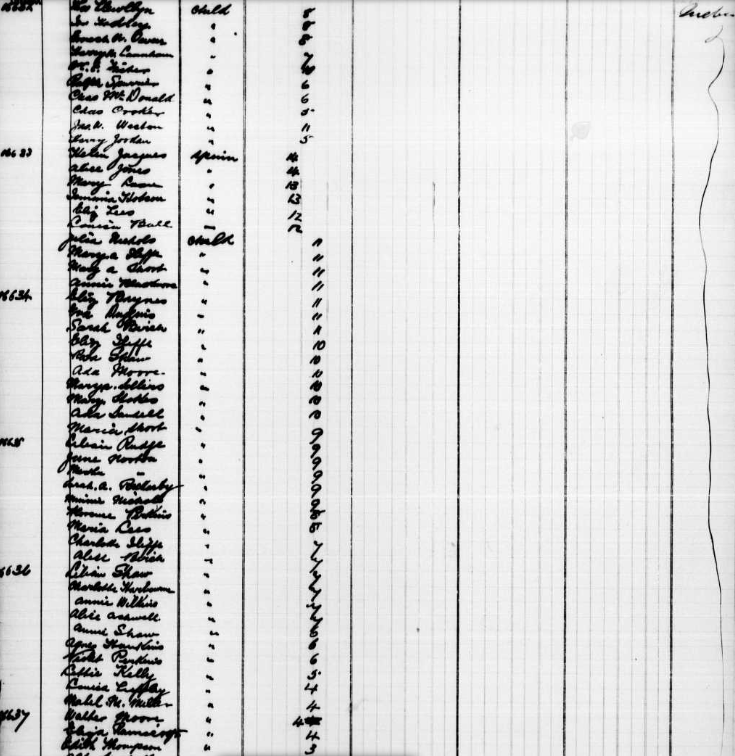 As I’m pouring over ancestral documents, I discover a ten year old child, Ada Moore, traveling on a ship with hundreds of other children, as young as one year old. I pour over the lists of names and feel sick to my stomach at this appalling state of history. I take pause for a moment. over the injustice. One page of six on the Circassian in 1883. 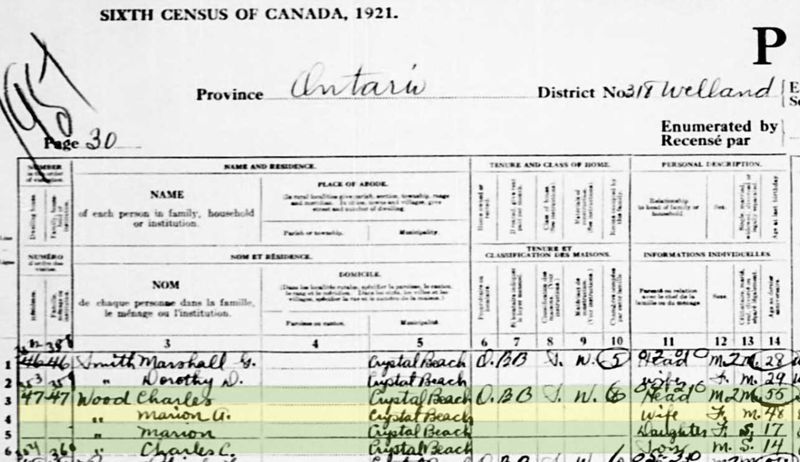 While I may never resolve how and when Marion Ada came to Canada, I CAN assume that she came around the time that her brother, three years younger, came, some time around 1889. I also have not located any documents from Hamilton, Wentworth, describing her work as a domestic, but this was likely her path. I find her marrying Charles (Chas) Wood in 1901 in Wentworth and later find her on the 1911 Welland District census with her little family, a daughter also listed as Marion A. and a son also named after his father, Charles. 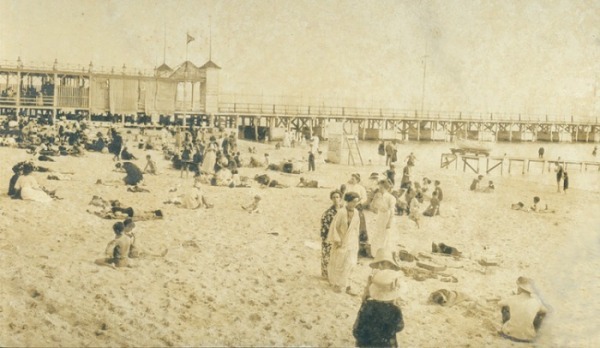 They are living with their teenagers in Crystal Beach, Muskoka in 1921. I have no death records for Marion Ada, but the search continues. Charles Wood Junior is found on various voting records and listed as an assistant in water works and as late as the 1940s, a Superintendent. it seems that the family settled over the long haul in the resort type location. On my next drive east, I’m going to stop in and see what I can learn about the Wood family of Crystal Beach.